As the LTE networks rapidly increase their reach globally, support for them is no longer exclusively reserved for high-end devices. The HTC One SV is a clear example of this trend. The Android smartphone is far from the Taiwanese company's top shelf offerings. Instead, the handset aims to offer affordable LTE goodness, packed in a well put together, fairly affordable package. As its name unambiguously suggests, the spec sheet of the HTC One SV is a blend between the HTC One S and the HTC One V internals, thus a mixture of old and new. The handset packs a Qualcomm Snapdragon S4 chipset, whose dual-core 1.2GHz CPU is quite leggy even for today's Android smartphone standards. Its 4.3" display on the other hand comes straight from 2010 with its WVGA resolution. 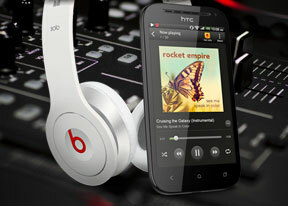 But let's take a deeper look at the full list of talents which the HTC One SV possesses. While the chipset and the connectivity options are up to today's standards, the WVGA display of the HTC One SV certainly raised our brows. However, having such a resolution does have its benefits too. The smartphone feels quite zippy, as its GPU has to deal with a relatively moderate amount of pixels. The battery certainly doesn't mind the arrangement too. This far, the HTC One SV identity has us a bit puzzled. The smartphone is clearly neither an entry-level offering, nor a fully blown mid-range device. So, has HTC entered a new market niche with the One SV? Read on to find out! As always, we will kick things off with an unboxing, followed by a design and build quality inspection. Editorial: You might notice that this review is shorter than usual and doesn't include some of our proprietary tests. The reason is it has been prepared and written far away from our office and test lab. Still, we think we've captured the essence of the phone in the same precise, informative and detailed way that's become our trademark. Enjoy the good read! Well, this phone us perfect, WiFi and all signals are very strong , now with in 4.1.2 runs smoothly and runs superfast! No lags good camera and screen visible under the sun very well! I come from note 2! Very happy I trusted again HTC!